Every year I look over my list of books I want to read on Amazon and Pinterest as well as those that I haven’t yet read on my bookshelf to compile a hopeful reading list for the upcoming year. Last year I shared my top 10 list, many of which turned out to be AMAZING books, but this year I’ve decided to try something a little different. Instead of just reading any type of book on my wish list (which usually consists of Christian non-fiction and time management books), I am going to strive to read DIFFERENT TYPES of books this year as a means to expand my topic knowledge and better understand those around me. You interested in joining me? Choose the different types of books you’d like to read and see what amazing finds you discover in each of those categories. Here are the 24 categories I am going to strive to read from this year. My Choice: In a Sun-Scorched Land by Ebenback This book was actually written by my pastor’s sister, and our church is considering it for a book night party. My understanding is that this book is both poignant and emotionally weighing as Jennifer shares a very real view of what it is like to be a missionary. No–sometimes it is not all dreamy and amazing. Sometimes it is just downright hard and raw. My Choice: 5 Love Languages of Children by Chapman. My husband and I recently recognized what our love languages are, and it has definitely helped us understand each other in the process. My hope is that the 5 Love Languages of Children helps us extend that understanding to our girls also. My Choice: Wife After God by Jennifer Smith. Yes, I am sad to say I never got around to reading this book last year. What excites me most about this book is that it is intended to bring you closer to both God and your husband. My Choice: Orphan Train by Kline. I’m going to be honest. I am really not a New York Times Best Seller type of reader, but I have a fascination with the Orphan Train which is why this book caught my eye. So, here I am going to take the plunge. Hopefully I will not be disappointed. My Choice: The Life-Changing Magic of Tidying Up by Kondo. I saw lot of bloggers write about this book in 2015 which caused me to stop and take notice. While I have read many an organization books, this one boasts lasting results. We shall see…. My Choice: The Four-Hour Work Week by Ferriss. This is one of those books that I often hear well-known business men and women recommend for success, and I’ve just never read it. It’s all about eliminating 50% of your workload to make more time and money. Sounds like a plan to me! My Choice: Me Before You by Moyes. I admit it. My husband and I have only been to a handful of movies since we have had kids. That said, when we do have the chance to see a movie, we make sure it is a good one that is worth both the time and money we spend to see it. This year I am going to take a pro-active approach and try to read a book or two that is being turned into a movie ahead of time. This story sounds both life-changing and captivating as one character learns that true love can sometimes involve heart-breaking sacrifices for the sake of another. My Choice: Launch by Walker. One thing I know I don’t do well as a blogger is launch product. I like creating it, but promoting it is…well…a challenge for me to say the least. My hope is that this top selling book will definitely help me with that as I launch 3 new products in 2016! My Choice: The Art of Social Media by Kawasaki. 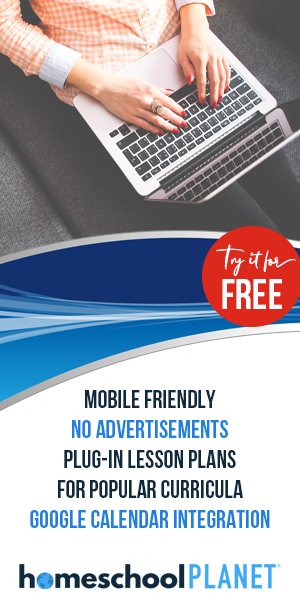 Whether we like it or not, social media is here to stay and if you don’t keep up with the latest trends you will invariably be left behind in the blogging and business world. Since I don’t have all the time in the world to devote to social media, I’m all about learning how to get the best bang for my time, and that is what this book is supposed to helps its readers do. My Choice: The Richest Man in Babylon by Classon. This is another one of those classic books that I often hear recommended by top business men and women. Although written in the 1920s, this book is still a top seller today for its simple financial advice told through a fictional Babylonian story. My Choice: Homeschool Experiment by Hawkins. I have never heard of a fictional homeschooling story which is probably what makes this books all the more enticing. I’ll be honest–I’m kind of tired of reading all the how-to homeschool books at the moment. However, having a book that can relate and provide me some light-hearted laughs? I’m in! My Choice: Simple Church by Rainer. This book has actually been on my bookshelf for awhile now. I’ve seen it on my pastor’s desk and had several church members recommend it to me. I’ve just never set aside the time to actually read it. I must say though that I do like the sound of it–a simple church–no bells and whistles required. My Choice: The End of America by Price. This is another area I generally avoid like the plague–politics. That said, have you ever thought what America has to do with the end times? I kind of feel like one reviewer going into this–a bit skeptical. However, I also look forward to seeing what John Price has to say as this is a subject that is often avoided in today’s world. My Choice: Utopia by Thomas More. In college one of my favorite movies was Ever After with Drew Barrymore. In it, Drew, aka Cinderella, often quotes Utopia with beloved excitement. As someone who did not read many of the classics until AFTER college, this has been on my to-read list for sometime. My Choice: Tilly by Peretti. In high school one of my favorite books was Peretti’s This Present Darkness. Since then I have tried to go back and read other books by Peretti and Tilly is one of the last ones on my list as it tells the story of one women’s travels toward grace and redemption after an abortion. 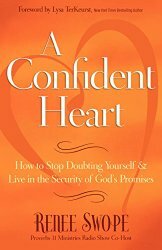 My Choice: A Confident Heart by Swope. This book was on my book list last year, but I’m bringing it back to read again as this is something I am constantly struggling with–self-doubt, self-worth, and well just the confidence to be who God wants me to be despite what others think. My Choice: Out of Mormanism by Robertson. My small group has recently discussed the importance of understanding those around us so as to better reach them for Christ and part of that is understanding the religions of those around you. This book is about one women’s journey both to and from Mormanism despite all persecution. My Choice: Fat Chance by Lustig. One of my goals this year is to get rid of processed sugar in my diet, and if you know me, you know this is a HUGE challenge for me. That said, I can use every bit of help and encouragement I can get, which is why the subtitle of this book, Beating the Odds Against Sugar, Processed Food, Obesity, and Disease, cause my attention right away. My Choice: Raising Musical Kids by Cutietta. Although I am a musician, sometimes I forget the simple things I should be including in our home just like any other mom and that includes musically. Both my girls already exhibit a love for music in their every day life, and I want to be sure that I am providing them the best environment I can to spur on their musical creativity. I have the book by Patrick Kavanaugh of the same name and definitely recommend it. However, this boasts a slightly different angle so I look forward to comparing these two books side by side for musical advice to not only try out on my children but also share with my students’ parents. My Choice: Tony Northrup’s DSLR Book. I’m still working on improving my photography skills and am hoping this will help me to make the switch from a point-and-shoot mindset to a DSLR mindset. We shall see. With 12 hours of videos and ever-increasing updates, this book sounds sure to not disappoint. My Choice: Love Poems from God translated by Ladinsky. Poetry is like a window to the soul. It’s an art form no other literature can obtain so what better way to communicate with God that through poetry? I definitely look forward to reading this poetry compilation for that very reason. My Choice: Until We Meet Again by Korenblit and Janger. This biography is actually about a husband and wife in my hometown who survived multiple concentration camps during World War II. This is their story, and how they found each other again. I can’t wait to read it not only because it is a great source of history but also because of the personal connection. My Choice: Leaving the City: 101 Tips for Moving to the Country by Peck. You don’t have to be a country homesteader in order to add this category to your reading list. This category can include everything from container gardening to bee keeping to raising chickens or cows. We just happen to have a dream to live in the country again someday so I figure I better do all I can to be ready when and if that time comes. My Choice: The Backroads of the Texas Hill Country. Our hope is to take a family trip to San Antonio, Texas this summer or fall. With this guide, maye we will encounter some fun little scenic stops along the way that we won’t soon forget! These just happen to be the 24 categories that I chose for my 2016 reading challenge, but there are several other choices you could include as well like science, art, medical, history, and more. Interested in joining me in reading 24 books from 24 different genres in 2016? Download this free printable to get you started on your own Reading Challenge for 2016! What TYPES of books do you plan on reading in 2016? Got any favorites you think I should add to my list for this year or next? Share away in the comments! Wait you’re talking about coming to Texas? I have added The Homeschool Experiment to my reading list, that looks interesting! Consequently, Pocketful of Pinecones by Karen Andreola is a really good fiction on homeschool as well, placed in the 1930s. I got Lessons at Blackberry Inn (the sequel) for Christmas 🙂 Just started reading that. btw, love your disclaimer! We are quick to judge each other on what we are reading, aren’t we?! But how do we know what is good (and what isn’t) if we don’t check it out!? Interesting books, always looking for something new to read … especially intrigued with the photography and the orphan train picks. LOL. Of course! Let’s see…Dallas/Ft. Worth area, right? How far are you from IKEA? LOL. Oooo…thanks for the lead. Pocketful of Pinecones sounds good. Simple Church–actually that is one reason I have waited to read it this long. I’ve seen both the positive and negative results of that book too. Yes, I will proceed with caution. Thanks for the heads up. And thanks for understanding the disclaimer. I just would hate to read one of these books, and then feel guilty for encouraging someone to read it when I had no clue! Thanks again for sharing your insight. Loved it and Pinecones is now on my wishlist for review after I read these! Hey Kris. So I just finished the Orphan Train book. Good read. I stayed up several nights just because I put it down. That said, I will give a word of warning, there is some language and one sexual abuse instance in the story so be just be aware. 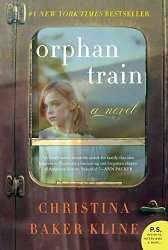 Life of those on the Orphan Trains were hard, but I liked the ending of this story. Basically, don’t misjudge a book (or a person) by it’s cover. They may be just what you need, and you may be just what they need. Nice list! I’ve been having fun reading people’s book lists this January, and yours is no exception. I’m doing the reading challenge posted by Tim Challies but I’m just picking the books for each theme as I go. Cool! I’ll have to check out his list. Sounds like a plan to me. You will have to let me know what gems you find for next year! This list makes me so excited! I’ve made a list of 12 books I want to read this year but, like you have in the past, got caught in the non-fiction and time management rut! lol! I’m still going to read those 12 books this year, but next year I hope to do a genre based list like this! Awesome! This list looks like fun, and I, too, am trying the types of books approach. A fried of mine reads 4 types of books, and I’ve been fixated on that for a while, but I need more types. Not 24, but maybe 7? Enjoy your reading year! What a great list! I may have to join you on this. I’m not a parent nor do I home school (obviously) so I might just leave those categories out. Thanks for the idea! I’m excited! Hi, great list of types of books. I hope you will share with my readers on Literacy Musing Mondays. Yeah! You will have to let me know what you think! So far I’m enjoying the variety and I seem to be reading books faster too. LOL. Sounds good. What 7 would you choose? What a great list! I’ve read a few of these and requested a few from my local library as I browsed your article. Thanks so much for the time you put into gathering these up. Of course! Adapt it for yourself! Let me know how it goes! Sure! Thanks for the invite!